Picture It – Or rather, Paint It. Sometimes when we look at a picture, we don’t stop to look at the entirety of it. We may appreciate the effect it has, find it attractive, and so on, but we don’t step too close to look at the fine details of it. Just a simple artist introduction today – nothing too profound. The artist is ume, someone I found on my brief trips through Tumblr. 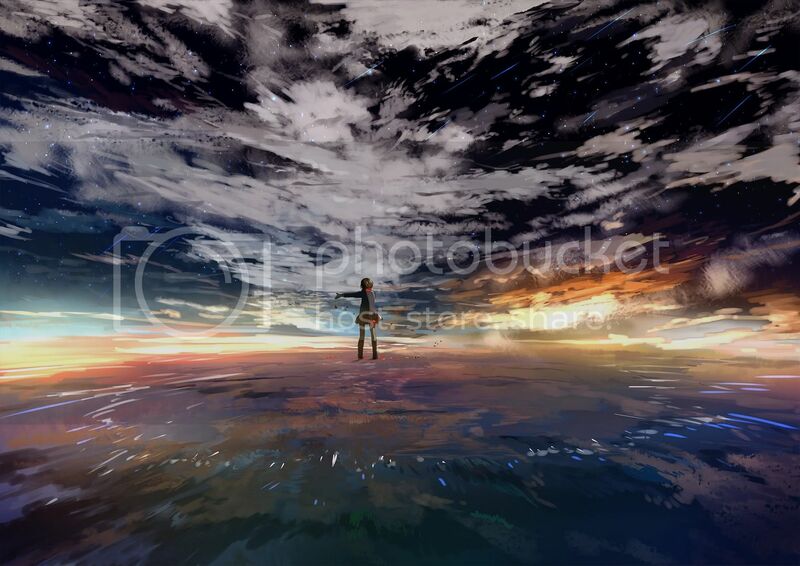 Her work was immediately arresting, and so I followed the source link to her pixiv page to check out her other works. I really like the use of colours, and the paint-brush like strokes which make up the painting. The overall effect of colour and composition is amazing. In itself, I suppose you could also call this appreciation of landscape art – similar but not quite like the cityscapes. If you look closely at it, the artwork just seems like a mess of brush strokes, but take a couple of steps back, and what a different effect it creates. It looks messy underneath, but turns out as something worthy of admiration. If you have a pixiv account, feel free to check out her page, but otherwise, click the images below to enlarge. I thought it would be nice to set an optimistic mood to the beginning of the semester by posting some poppy upbeat songs. The first song comes from an album called daisy strategy by miskyworks. It was only some time after I first listened to the album that I found out that the songs were in fact Touhou arranges. The songs are covered in an interesting, unique fashion. Although the album is quite short, each track is done in a separate style, which are all pleasant to listen to. Next is a vocaloid song with a hook that got me addicted within moments, Hello Strobe by powapowaP. I am fond of musicians who blend traditional and modern, and I get a kick out of that “glitchy” effect. Also it happens to be easy enough for me to sing at K! Many of you may have heard the OP to last season’s Denpa Onna to Seishun Otoko, but probably missed out on the awesome other track from the OP single. Done in a similar style to the OP, but now with cute onomatopoeia!